If you have a cherished tool that is showing signs of wear and tear you may want to consider having it reconditioned. 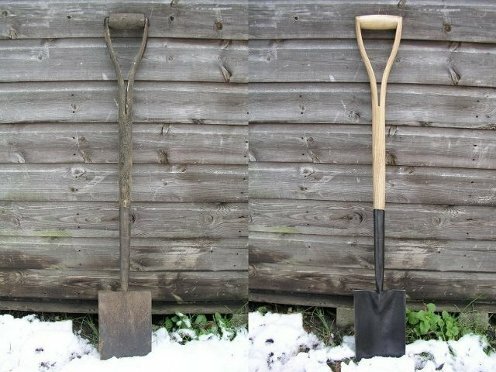 The photos above show an Elwell border spade before and after reconditioning. This tool (about 50 years old) was well worth saving. The cost was about the same as buying a new but inferior item. My tool reconditioning activities have featured in Reclaim Magazine. 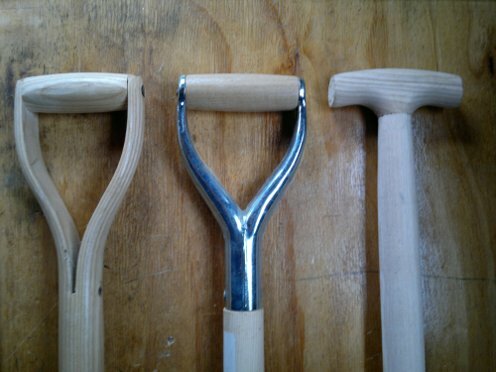 Digging tool handle options are, from the left: wood YD, metal YD, shaped crutch T.
Please not that I don't fit or repair plastic handles, I'll only replace fork and spade handles with the types shown above. These prices will apply to most re-handling jobs. Things that might cost a little bit more than standard handle replacement are welded and forged repairs to tool heads, and making or sourcing special handles. Rust removal and sharpening are available from £5.00 per tool, depending on how sorry it looks! Postage and packing is charged at cost. Please note that I'm efficient at repairing tools, but rather slow to pack and post - apologies for that, but I can't afford a personal assistant! To arrange tool repairs contact me. 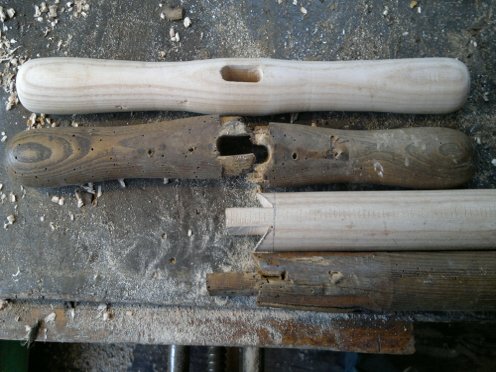 Sometimes repairs to the tang or socket of a tool may be needed. Here the tang of a grasshook is being straightened and drawn down (lengthened) at red heat. I will always save an old handle if possible - i.e. if it is safe and worthwhile to do so. If not, I'll fit a commercially produced replacement handle that is a good match. 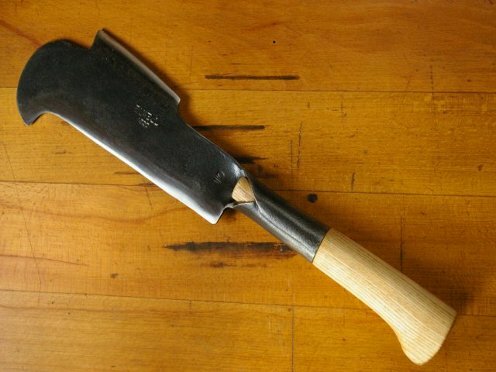 Some old tools deserve a hand made handle, as shown above. 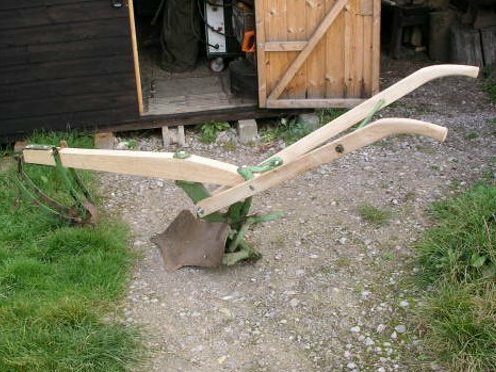 This was made to fit a Kent pattern billhook, because no mass produced replacement was available. It takes a bit of time and experience to get this right, however the end product tends to be worth the effort. This photo shows the copying of a "T" handle for a bulb planter, with the long turned grip attached to the stem by a pegged mortice and tennon joint. 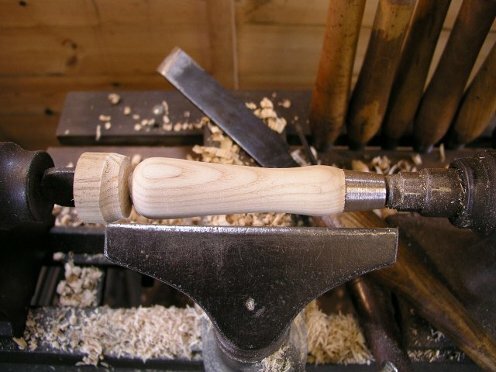 Turning a new trowel handle on a Victorian treadle lathe - I did say I was a luddite! 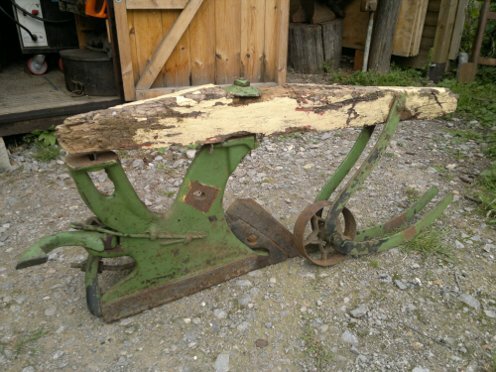 I'm willing to restore more unusual items, like this horse plough. ... ready for work once again. 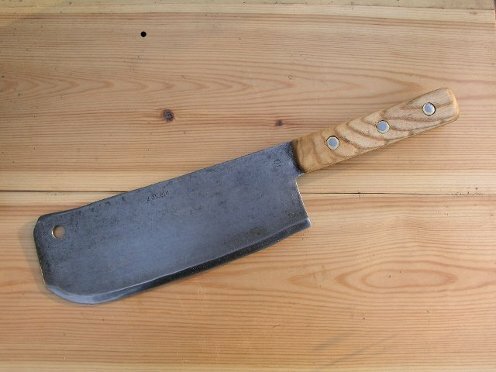 This is a cleaver that I re-handled for Mr Walton at The Outwood Butchers. No modern replacement would feel right for day in, day out use. To enquire about tool repairs contact me. 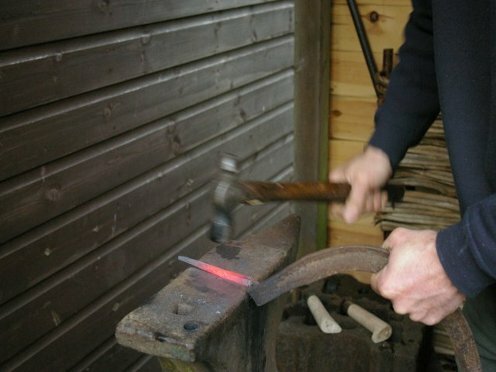 I've run courses on tool maintenance and sharpening for various people: Surrey & Sussex Wildlife Trusts, National Trust Nymans woodland volunteers, the Garden House in Brighton, and for the 100w artist's collective.